No Compromises, No corners Cut, EVER. Or, it will be in the near future. Another one of my own design, from scratch. Aside from the bar-wood action, the rising bite and the sidelever, it's going to be pretty conventional. A hammerless, breechloading homage to the percussion-era, when British guns reached their aesthetic zenith. The barrels are 28 inches, it will sport a straight hand stock with Westley Richards-style grip safety, splinter forend (wedge retained, of course) and the target weight is five and a half pounds. The breeches are of dovetail lump construction. Clamped for brazing, I know, black iron wire is "traditional"but for the task of brazing (and the temperatures involved) it simply doesn't compare to stainless worm-drive clamps. The barrels and frame are jointed. 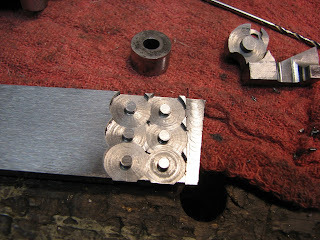 The blocks soft-soldered to the barrels are temporary. They are machined to be parallel and square to the lumps and barrel flats. Their purpose is to facilitate clamping in the mill and bench vise. The frame is machined for the striker bushings. The forend lug is made and silver brazed in place and the forend iron is rough-shaped. The triggerplate and inboard portion of the sidelever. The outboard portion of the sidelever blanked. Making the swivel for the spring that will power the sidelever and bolts. All of the parts of the bolting, sidelever and extractor mechanisms. Jointed, bolts fitted and extractor mechanism fitted. Time for some hammer and chisel work! The left fence is roughed in. A little further along with the shape-up. Triggers are made and hung. The safety mechanism is also made. Almost done, the sear springs remain to be made and installed. I didn't take any photos of the sears, screws etc., I was too busy filing. Here's a video clip of the right lock. All content is the property of Vicknair Restorations and may not be used in any form without permis. Picture Window theme. Powered by Blogger.